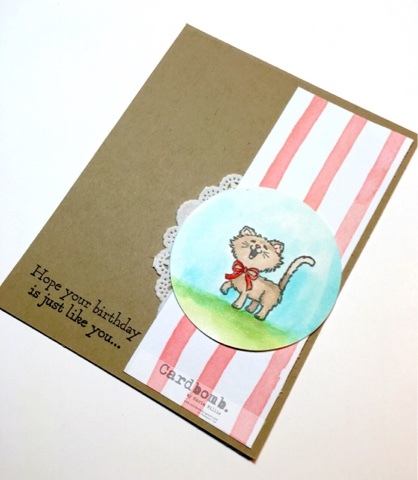 Cardbomb: Well, hey, Pretty Kitty! Hi and happy Saturday morning! I'm off to enjoy some beautiful weather today with family and friends. We're going to take my friend's baby swimming for the first time! I hope you're getting the chance to enjoy some beautiful weather too! I'm taking part in the #imbringingbirthdaysback movement and today is my friend Kat's birthday. She loves cats and calls them "kitten cats!" Lol! So, of course I had to make her a kitten cat card. Thank gosh for the new set Pretty Kitty because it has the sweetest little kitties you ever did see. Here's Kat's card. This is just one of the adorable kitties in the set. 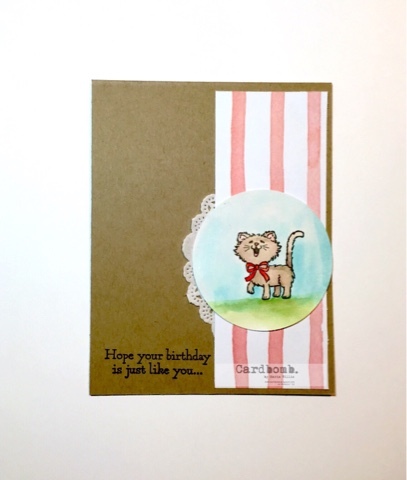 I water colored a whole bunch more so be on the lookout for more kitten cat cards soon. Alright, I'm off to go throw some food together and go enjoy this amazing day! I'm hoping you all have a wonderful day too!